Doctor Edward Boudreau, D.C., a North Carolina licensed chiropractor (NCCA, ACA) is very successful at treating your worst pain, from chronic neck and back pain and headaches to joint and extremity pain, ongoing tingling and fibromyalgia. If you, or someone you know is suffering, call 336.664.6446 or e-mail us or click “Request An Appointment” to schedule a free consultation. Your first visit will likely consist of a full and detailed case history, complete examination, orthopedic and neurologic tests, x-rays (if clinically necessary) and filling out a small amount of paperwork. After the doctor reviews and correlates all relevant facts about your specific condition, he will inform you of the nature of your specific condition in what is called the “Report of Findings”. During this time, you will find out what your condition is, if the doctor can help you, how long it should take to correct the cause of your problem, what you can do on your own to increase your healing time, and what costs that apply. If it is determined your condition is not a case that will benefit from chiropractic care, we will refer you out to someone who we feel can help! Your first appointment will take approximately one hour, and your consultation with the doctor will likely be scheduled for the next day. 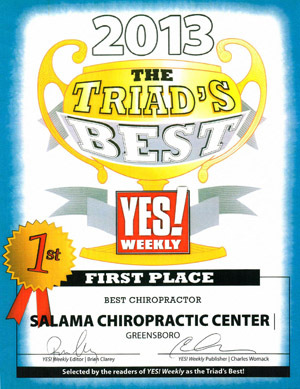 If you are interested in scheduling an appointment, please call 336.644.6446 or fill out this form. Most appointments can be scheduled on the same day! To be filled out by all new patients. and see and feel how our chiropractic therapies can help you. Our Oak Ridge office is conveniently located to serve those from Summerfield, Stokesdale, Kernersville, Walnut Cove, Walkertown, Madison, Mayodan, Reidsville, Greensboro, Wentworth, Belews Creek, Belews Lake, Scalesville, Colfax, Friendship, Bonanza Hills and surrounding areas.